What did the Sun-Times bilding look like? It will add alot to Chicago's skyline. Yeah what did the Sun-Times building look like? I kinda like the Trump. It'll look good in Chicago. Yeah what did the Sun-Times building look like? The Sun-Times building is not the most appealing to the eye. I would definetely agree with replacing it with the TIHT. and when its completed what will it be ranked heght wise in chicago. cool thanks. does anyone know about the worlds tallest thing though? yeah.. the Trump building will look okay at least better than the Sun Times building and I hope they do try to stay to the architectural integrity of this great city. Plus this is p-r-i-m-e real estate land.. it is a beautiful spot and I am not surprised that he got it. I am just in a Trump overload... too much of it everywhere and here he comes to my town. This isn't my favorite building design in the world, but it's not all that bad. It certainly looks much better than the ugly Sun Times Building ever did. I definately like trump tower better. Is the height order that you listed structural or is it with antennas? its 342.9m without antenna. with the antenna its slightly over 400m. I think that it will look pretty neat when it is completed. The Sun Times building is an eye-sore. I don't think it should change it much. But the Wrigley is definetely a beautiful building. Pic of which, the Wrigley or the Hotel & Tower? Go to www.emporis.com and then find Chicago, then use the building search. i was asking for wrigley and at the time i was too bored to do that. I would like to see a shot of it too, if you have one. thought this was a cool shot from on top of the sears tower. That is really nice aerial view. 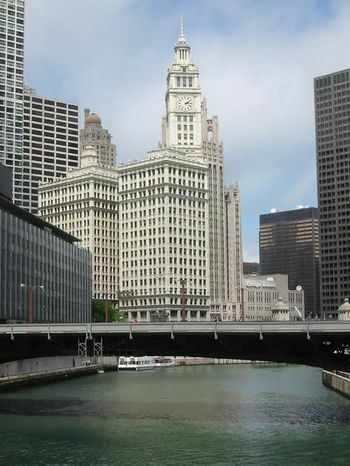 The Wrigley building ("the one with the clock") - is nice in those pics, but if you are lucky enough (and maybe a few of you out there have some images) to see it at night when the lights shine on it, it is much nicer. They usually change the lighting sometimes blue, green depends... The trump tower will block some views... but it still should be ok.
change is ok... really-- gotta remind myself. when does the trump tower begin construction? I'm not sure off the top of my head, but when I went up in May I had lunch with one of my old co-workers. She now works for a company that was located in the Chicago Sun-Times building and they were given two months to get out so that puts the deadline for moving out around the end of July or so. I'd say they've probably already started at least some preliminary work on demolition of the Sun-Times building. is the chicago sun times chicag's major paper? and where is it relocating to? No, it's the minority paper and it's struggling. Chicago Tribune is the primary paper there and is extremely popular.